There are numerous reasons why our patients request rhinoplasty, also called nose surgery or nose reshaping, including breathing difficulties, a recent injury, or general dissatisfaction with the appearance. Rhinoplasty is designed to reshape the nose to enhance facial symmetry, create a more appealing aesthetic, and correct functional problems such as a deviated septum. In light of the procedure’s popularity, Dr. Ali Sepehr, our experienced facial plastic surgeon, recently answered several common questions patients interested in rhinoplasty may have. If you would like additional information or wish to schedule a consultation with Dr. Sepehr, please contact us today. Q: What conditions does rhinoplasty or nose reshaping commonly correct? Dr. Sepehr: Rhinoplasty can correct both form and function of the nose. Depending on the aspirations of the patient, it can often produce results more appropriate to the gender and ethnicity of the individual. Rhinoplasty can also help correct a traumatic injury, allowing the nose to blend with the rest of the face, often going unnoticed and making the eyes and lips more apparent. For patients experiencing breathing problems, my septorhinoplasty technique can address nasal obstruction and/or congestion. Ultimately, rhinoplasty is intended to provide an aesthetically pleasing outcome that is proportional to the face. Dr. Sepehr: The investment for rhinoplasty can range from $5,500 to over $10,000, depending on the complexity of the case. Some factors that may affect the cost include whether it is a primary, secondary, or revision rhinoplasty, if there is a need for cartilage grafts from the ears or ribs, and if anesthesia is necessary. Q. What’s the difference between “open” and “closed” rhinoplasty? How do I know which method will best suit me? 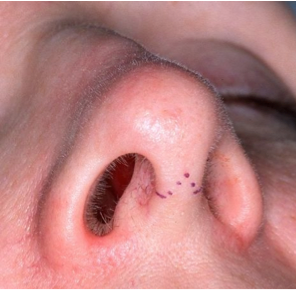 Dr. Sepehr: Open, also called external, rhinoplasty is defined by an incision below the columella (see picture below). It allows better exposure and more accurate results, and it is generally the recommended technique for more complex cases. Closed, also called endonasal, rhinoplasty is an option for more simple nose surgeries. It also allows for more rapid swelling resolution. Your recommended method should be determined through a consultation with an experienced rhinoplasty surgeon. Q. What risks are associated with rhinoplasty? Dr. Sepehr: The risks are generally small. Anesthesia complications are rare, and infection, bleeding, and scars are very infrequent. In rare cases, patients may be dissatisfied with the cosmetic outcome; however, this can often be avoided. By listening to your concerns and establishing a good rapport, your facial plastic surgeon should be able to develop a clear picture of your desired results prior to the procedure. Q: What is the recovery time for rhinoplasty, and how long will I be out of work? Dr. Sepehr: Most patients feel minimal pain after the procedure, and medication is provided to help manage discomfort. Swelling and bruising are common and can often be reduced by sleeping with the head above heart level. Most patients will be out of work for approximately one week, and signs of surgery may be visible to others for about one to two weeks; however, these signs can often be covered with makeup. Q: When can I expect to see the full results of the procedure? Dr. Sepehr: While every patient is different, you can typically see the final results approximately 6-12 months after completion of the procedure. Q: Rhinoplasty is recognized as one of the most complex of cosmetic procedures. What should I look for when selecting a rhinoplasty surgeon? Dr. Sepehr: You should look for a facial plastic surgeon specializing in rhinoplasty who focuses on nasal surgery. Additionally, a qualified surgeon will have significant experience dealing with the nose and septum. If you have additional questions about rhinoplasty or would like to schedule an in-person consultation with Dr. Sepehr, please contact our office today.